The second of our widely acclaimed and renouned “Live” series, it’s “Live From The Devil’s Triangle, Volume II”. It’s so good, we made it a double cd this time. As always, an international cast of bands and a wide variety of genres are represented in this cornucopia of modern sounds. 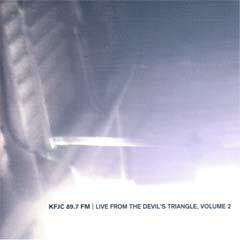 The “Live From The Devil’s Triangle, Volume 2” CD is available as our thanks for your generous donation of $33.33 or more.